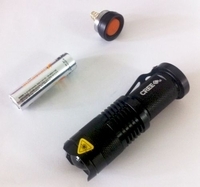 The Cree Q5 LED Flashlight is a dependable & handy mini light source that's perfect to carry everywhere with you. With a length of less than 10cm & weighing just 65g, the compact form factor makes its really convenient to keep in your pocket. 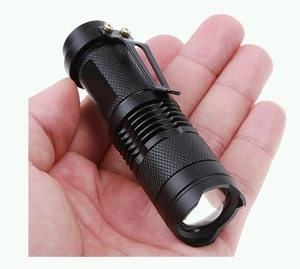 It also also a powerful light source capable of up to maximum of 300 lumens brightness. The adjustable focus lens gives you lots of flexibility. You can select the right beam focus to either have a super bright & penetrating concentrated light beam, or a super wide angle beam good for overall area illumination. Useful for outdoor activites like camping or cycling, or in your car or your home as a handy mini backup light source.